Floatplanes are my favorite subject, and Alaska is one of the best locales to photograph them. I'm attracted to shooting floatplanes because they combine the elements of aviation and water in beautiful, sometimes dramatic, wilderness settings. In some of these images, the floatplane is purposefully a small element in the overall composition in order to focus attention on the grand scale of the wilderness environment they operate in. These images were shot in Alaska in 2005--I can't wait for my next trip North! 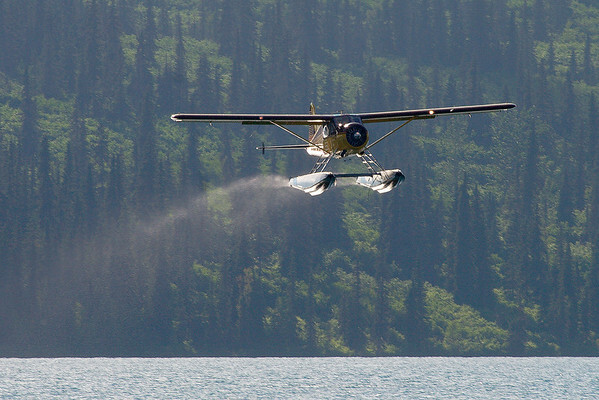 Duke's deHavilland Beaver departing Chelatna Lake. Notice the water streaming off the floats.